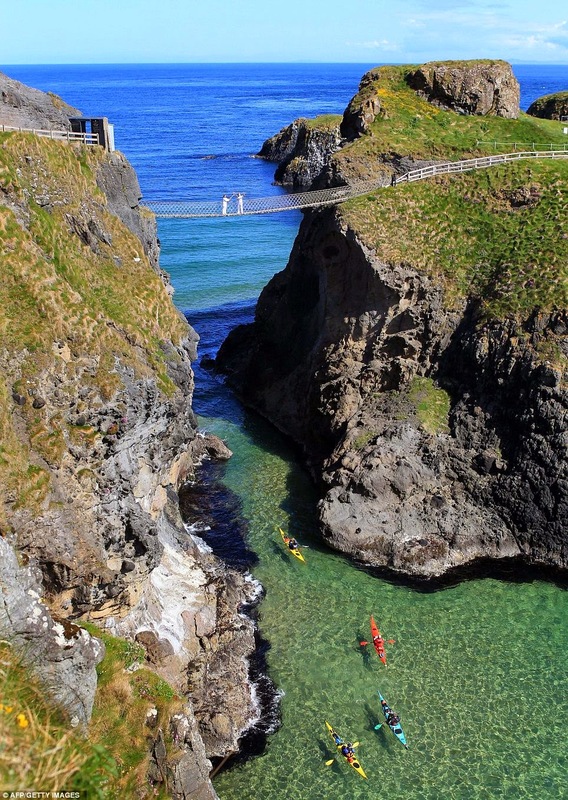 Carrick-a-Rede…say what? I believe it's Irish for scare the tourist, or terrifying rope bridge. Still, one must brave the 66 ft length of rope strung 98 ft above the rocks and sea because…well…it's incredibly alluring. Throngs of people have crossed it, thousands have been photographed on it, and Olympic torches have been carried over it (pictured left). It's a traveler's opiate! 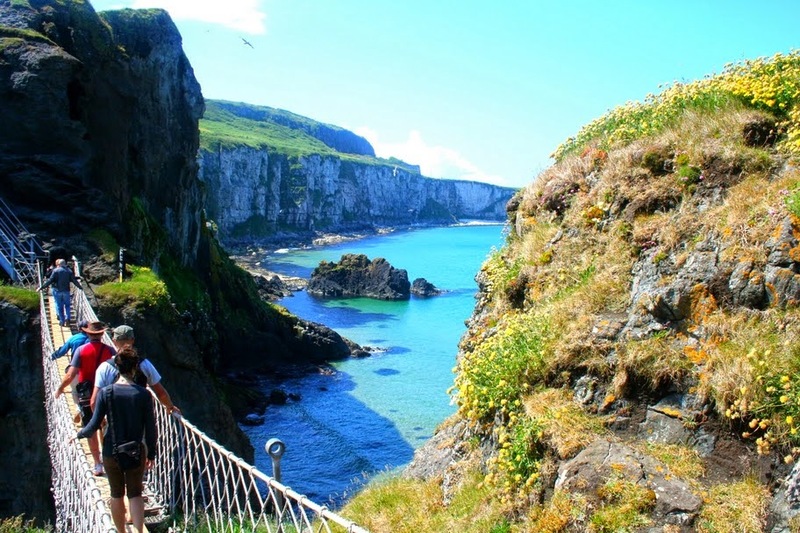 The Carrick-a-Rede rope bridge links the mainland to the tiny island of Carrickarede (from Irish: Carraig a' Ráid, meaning "rock of the casting"). Originally a salmon fisherman's paradise (thus the original bridge), the huge rock is now more commonly known for its spectacular views. From the pictures (above and below), it's clear there have been some improvements to the bridge over the years. I'd cross it in a heartbeat (I think), after all, I've stood on the very top of the Golden Gate Bridge. I've climbed a glacier in New Zealand. I've stood in a clear glass box hanging on the side of one of the tallest buildings in the world. This is a mere 66 ft, right? Truth is: it looks a little imposing. Hey, those of you who snicker, the Golden Gate Bridge is solid and glaciers move really slowly. Maybe we could find out when it was last inspected and ask everyone else to wait their turn. OK, now I'm ready. Wait, how many people will it hold? 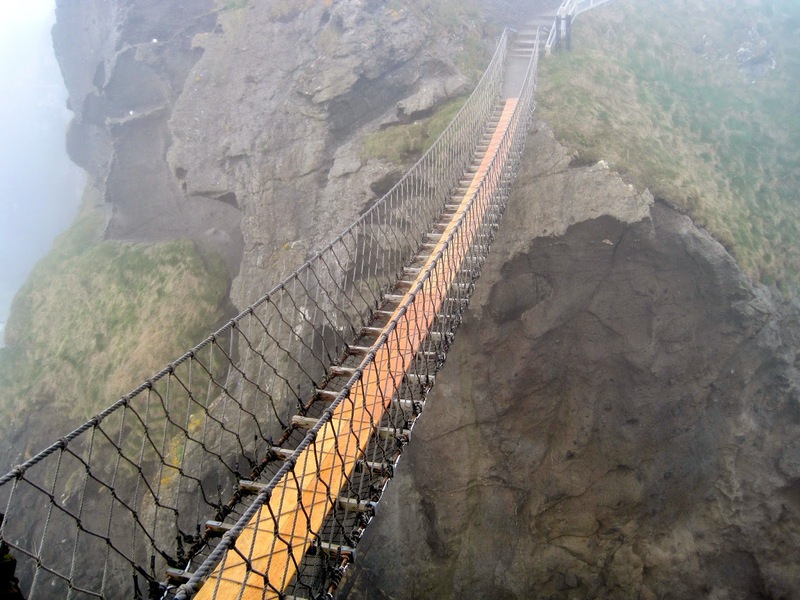 I would seriously love to cross it, but, in all honesty, I would be a little nervous. What can I say, travel and adventure are my opiates, and, sometimes, "simply amazing" involves a little fear.